Magic Holidays: Why we celebrate Dasara - Vijaya Dashami? 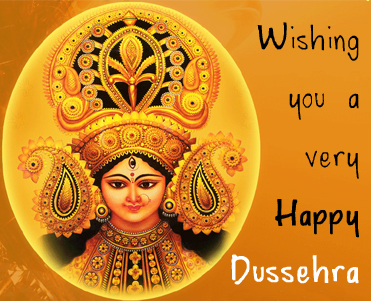 Why we celebrate Dasara - Vijaya Dashami? The grand festival of Hindus, Dasara - Vijaya Dashami is a Hindu festival that symbolically celebrates the triumph of good over evil. As per Ramayana the festival basically celebrates the victory of Hindu deity Rama over demon King Ravana who is portrayed as having ten heads. The main reason of the war between Lord Rama and Demon king Ravana was the kidnapping of Sita by Ravana and keeping her in an isolated place. Ravana turned down every request by Rama to return back Sita unconditionally. The only alternative remained with Lord Rama was to win back Sita by defeating Ravana in a face to face war. Ravana was finally defeated after a fierce war which lasted for several days. The festival of Dasara was initially called Dash Hara meaning loosing ten heads by Ravana, which later became popular as Dasara. Rama defeated and killed Ravana in his own kingdom of Lanka. 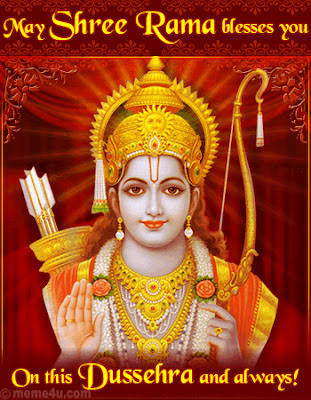 Rama returned to his kingdom of Ayodhya on Ashwin Shukla Dashmi and hence it is celebrated as the day of victory or Vijaya Dashmi meaning victorious tenth day of Ashwin. Presently it is a gazetted holiday in India, which is marked on the 10th day of the bright half called Shukla Paksha in the month of Ashvin, according to the Hindu calendar. Hindu people observe this important festival through special prayers and offerings in the form of food to the gods at their residence or in the temples. This festival is celebrated throughout the country with great enthusiasm. Houses are nicely cleaned and decorated. Special vegetarian festival food is prepared and there is a festive atmosphere every where. In Maharashtra dasara processions are taken at Mumbai, Thane and many other places. The participants wear traditional costumes and chant the prayers of Shri Ram. People celebrate it as the special day offering prayers at home and in the temples. In major Indian cities like Mysore and Shirdi it is celebrated with lots of pomp and fervor. Mysore actually gets dipped for ten days in the Dasara celebrations. Outdoor fairs called melas are held at many places. The effigy of Ravana with ten heads is burnt in the evening of Dasara. A performance called Ramlila which is the short version of epic Ramayana is played during this period in most parts of Northern India. It describes the best qualities of Rama and throws light on the life of this great hero who is supposed to be the ideal personality. Ramlila providing knowledge and entertainment to the public continues for ten days. On the tenth day a big effigy of Ravana bearing ten heads is erected near the venue of Ramlila performance. The performance is concluded when the character of Rama shots an arrow on the effigy of Ravana and it is burnt by the crackers placed inside. This festival always reminds us of one fact that evil in this world is temporary and it is always destroyed when the proportion of evil exceeds certain limit. So every one of us should stay on the good path of life and never do injustice to anyone around us. One day or the other the evil powers in the world, whatever strong they might be are overpowered by the good. We at Magic Holidays believe in this truth of life and would like to advice everyone to be on the good path.